1. The fur on polar bears is actually translucent. Their fur reflects visible light, making it appear white. The skin underneath the fur is black. 2. A newborn polar bear can weight as little as one pound. 3. Adult female polar bears can weigh between 330 and 650 pounds. Male adults can weigh from 775 to about 1,200 pounds when they are fully grown. 4. Adult males can be as tall as 11 feet when they are standing on their hind legs. 5. Little bumps, called papillae, are located on the bottom of the paws of polar bears to help prevent them from slipping on the ice. 6. Polar bears have been known to live into their mid to late 30s when they are in captivity. In the wild, they only live to be between 15 and 18 years old on average. 7. 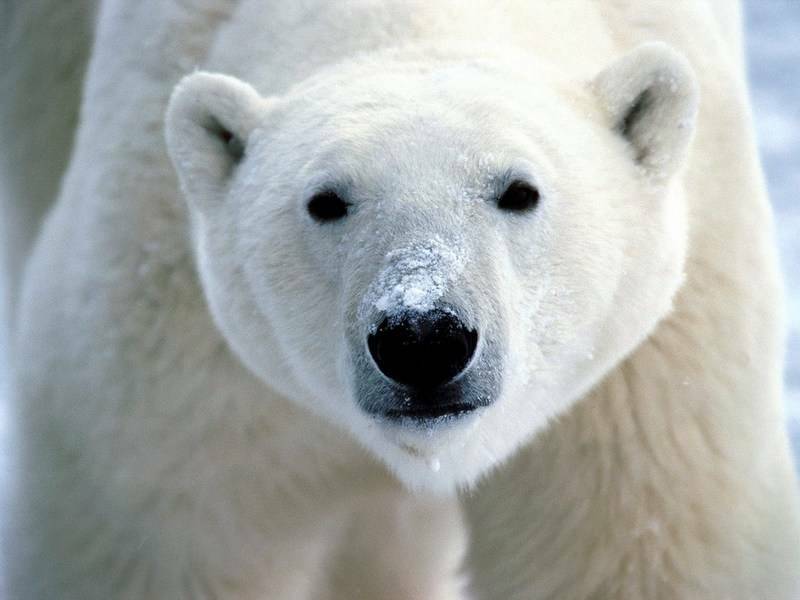 A polar bear can smell a seal from about 20 miles away on the ice. 8. About 60 percent of the world’s polar bear population lives in Canada. The rest of the population is spread out over parts of Alaska, Russia, Norway and Greenland. Biologists believe there are between 20,000 and 25,000 polar bears living today. 9. A polar bear’s paws can measure up to 12 inches across. This helps distribute their weight better when they are walking on the ice. 10. For the most part, polar bears have a leisurely stride. But they can gallop like horses for short periods of time. 11. Polar bears rarely expend energy when hunting for prey. If they sprint for longer than 12 seconds, the calories they use would be more than the calories they would consume following a catch. 12. When polar bears wag their head from side to side, it means that they want to play. 13. Polar bears tend to keep themselves clean because dirty and matted fur does not insulate their skin efficiently. 14. Polar bears sleep for about eight hours at a time. They often take naps, too. 15. The only polar bears that hibernate for months at a time are pregnant polar bears. They will go into dens while they are pregnant and wait there until they give birth. 16. When food is scarce, polar bears are able to reduce their metabolism so they do not burn too much energy. They can adjust it once again when food and prey is more abundant. 17. The reproduction system of polar bears is unique in that it uses delayed implantation. The mating season typically lasts from April to May, but the fertilized ova are not actually implanted until the following autumn. 18. Polar bear cubs nurse from their mothers for at least 20 months. 19. The earliest records of polar bears in captivity dates back to Ptolemy II, an ancient king of Egypt around 250 BC. There are polar bears recorded to have been in Ptolemy II’s private zoo which was located in Alexandria. 20. America’s first zoo had polar bears as one of its attraction. It opened in 1874 in Philadelphia. 21. Polar bears have more of a chance of overheating than they do from getting too cold. 22. The polar bear is at the top of the food chain in the Arctic. They help keep the ecosystem balanced by helping to prevent the overpopulation of seals. 23. Female polar bears often give birth to twin cubs, but they also give birth to single cubs and triplets, too. Their first litter is born when they are between four and eight years old. They typically only give birth five times in their lifetime. 24. Scientists currently recognize that there are 19 unique populations of polar bears on the earth, but none of them are a subspecies. 25. Polar bears are only prey for humans and other polar bears.